I loved how When the Truth Unravels is a story about friendship, depression, and still allows us to witness individual character growth. When the Truth Unravels is fabulous. There’s mystery laced through the pages, but even more so it’s a book about telling our truths and finding support in friendship. Sometimes there are secrets we can’t even tell our best friends. This multiple POV novel looks at a mystery, Elin’s disappearance on Prom night and unravels all these threads about what happened. What secrets have we been keeping from each other, and can our friendship survive these hidden truths. It’s a tender story about depression, self-confidence, and never feeling like we can be enough. I just wanted to protect each of these main characters. They made a place in my heart. Their tender vulnerabilities, fragile strength, and hidden secrets. Whether you love characters trying to cover up their insecurities, bury their trauma, or chase perfection. When the Truth Unravels has a character for you. There is something for you to treasure, that will resonate with you. And each one of their perspectives scream from the pages, highlighting their unique-ness, their own scars. I can’t pick my favorite character at all. What I also loved was the depression representation in the book. It’s hard to talk about without spoiling how you find out about the depression, but it is fabulous. It’s multi-faceted and this conversation is one of the best I’ve read recently. And what propels the book is the mystery of why. It haunts the main characters in unspoken conversations. But what really keeps you reading is the friendship between all of these girls as they prepare to split off to go to college. It’s a time of transition, of great change, when everything can either break or promises are made. I think that’s the beauty of this book is that there is mystery and secrets, but at the heart of this book is about friendship. Moments you don’t know what to say, except to accept in silence, and trust that the truth will be unraveled. 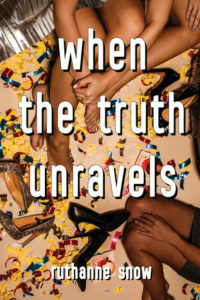 Find When the Truth Unravels on Goodreads, Amazon, Indiebound, and The Book Depository. What is your favorite recommendation of books with friendship? I did a whole post about some of my recent favorites, and this is going to be on the next one! If this book sounds good to you, you might like This is What it Feels Like and The Deepest Roots.